Grade I (low-grade) — The tumor cells look more like normal cells under a microscope and grow and spread more slowly than grade II, III, and IV tumor cells. They rarely spread into nearby tissues. 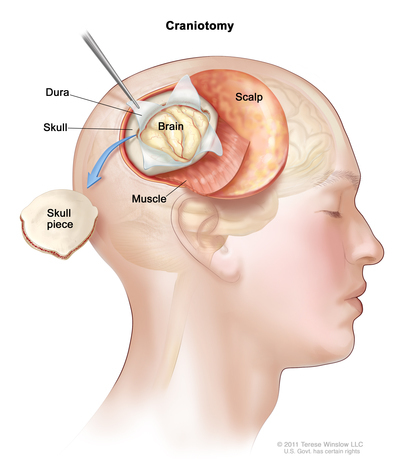 Grade I brain tumors may be cured if they are completely removed by surgery. Grade II — The tumor cells grow and spread more slowly than grade III and IV tumor cells. They may spread into nearby tissue and may recur (come back). Some tumors may become a higher-grade tumor. Grade III — The tumor cells look very different from normal cells under a microscope and grow more quickly than grade I and II tumor cells. They are likely to spread into nearby tissue. Grade IV (high-grade) — The tumor cells do not look like normal cells under a microscope and grow and spread very quickly. There may be areas of dead cells in the tumor. Grade IV tumors usually cannot be cured. A mixed glioma is a brain tumor that has two types of tumor cells in it — oligodendrocytes and astrocytes. This type of mixed tumor is called an oligoastrocytoma. Ependymoma (grade I or II): A grade I or II ependymoma grows slowly and has cells that look something like normal cells. There are two types of grade I ependymoma — myxopapillary ependymoma and subependymoma. 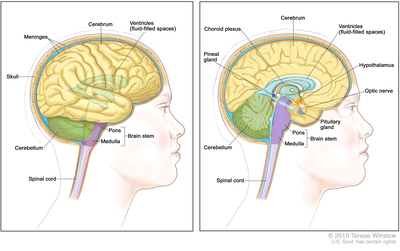 A grade II ependymoma grows in a ventricle (fluid-filled space in the brain) and its connecting paths or in the spinal cord. In some cases, a grade I or II ependymoma can be cured. Neurological exam: A series of questions and tests to check the brain, spinal cord, and nerve function. The exam checks a person’s mental status, coordination, and ability to walk normally, and how well the muscles, senses, and reflexes work. This may also be called a neuro exam or a neurologic exam. Visual field exam: An exam to check a person’s field of vision (the total area in which objects can be seen). This test measures both central vision (how much a person can see when looking straight ahead) and peripheral vision (how much a person can see in all other directions while staring straight ahead). Any loss of vision may be a sign of a tumor that has damaged or pressed on the parts of the brain that affect eyesight. 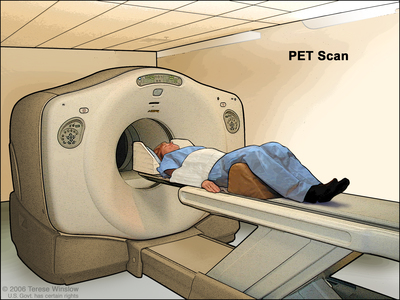 SPECT scan (single photon emission computed tomography scan): A procedure to find malignant tumor cells in the brain. A small amount of a radioactive substance is injected into a vein or inhaled through the nose. As the substance travels through the blood, a camera rotates around the head and takes pictures of the brain. A computer uses the pictures to make a 3-dimensional (3-D) image of the brain. There will be increased blood flow and more activity in areas where cancer cells are growing. These areas will show up brighter in the picture.